This stunning one of a kind pendant is handcrafted from solid copper and sterling silver. Cut, textured, lightly blackened and polished by hand. A very dramatic looking piece of over-sized jewellery suitable for various occasions. 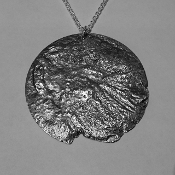 Hangs from a 50 cm sterling silver chain.